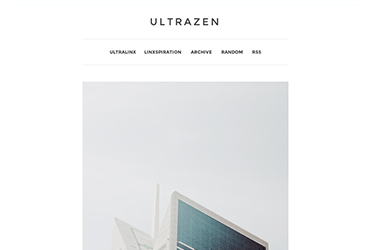 UltraVisual is a very minimalistic and clean grid style Tumblr theme that has a masonry layout. 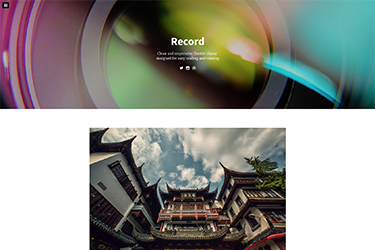 It's perfect for photo bloggers. If the default colors don't take your fancy, don't worry, we have you covered. There are an array of customisable colour options including page background, text colour, link colour and much more. Don't like the standard fonts available on your machine? Use a Google web fonts instead! With over 600 fonts to choose from, you're spoilt for choice. Just type in the name of the font (eg. Open Sans) into the 'Body Google Web Font' field and it'll load up live. If you're a tweeter, you'll be glad to know there is an integrated Twitter widget. To get it working, make sure you are signed into Twitter in the Tumblr settings for your blog. Consider yourself a pro huh? Well you can show off your awesome pictures with the integrated Flickr widget. The Flickr widget shows four images at once. You will need to get your Flickr ID, then put it into the required field. Show off your Instagram shots with the integrated Instagram widget. The widget shows four images at once. You will need to get your Instagram Access Token, then put it into the required field. Ahh so you're a pixel pusher? 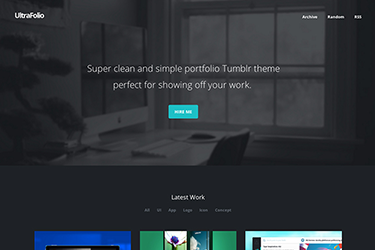 Well you can show off all those pretty pixels with the integrated Dribbble widget. 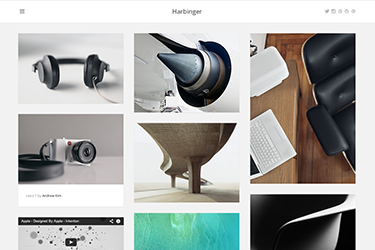 The Dribbble widget shows six shots at once. You can hide meta data (tags, date and notes) for posts on the homepage which can give you a much cleaner look like you see in the demo. Customizable colours: background, body text, title, description, tweets, nav, links, sidebar dividers, social links, post background, tags and meta. 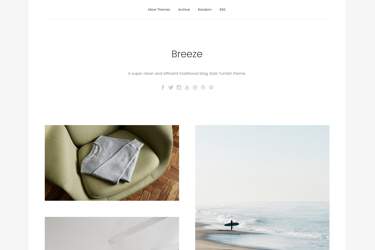 A super minimal and clean theme with a very traditional blog style layout. 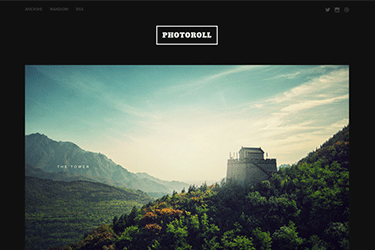 The perfect theme for the photo blogger or photographer. 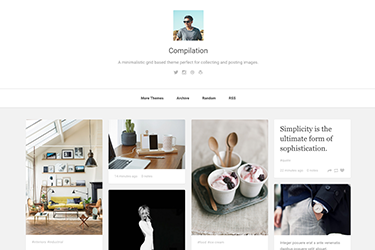 A Tumblr theme with a very traditional blog style layout, perfect for any type of blogger. 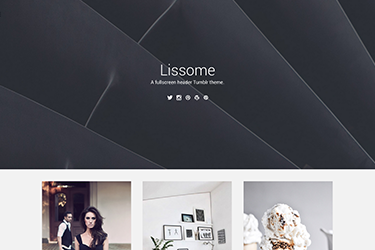 An elegant and classy magazine style theme, featuring a masonry style layout. 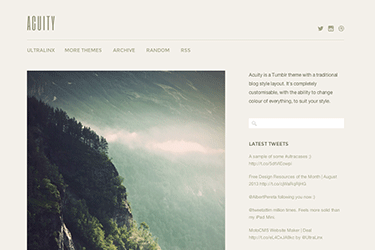 A clean and flowing Tumblr theme with an awesome parallax header and a smooth masonry style layout. 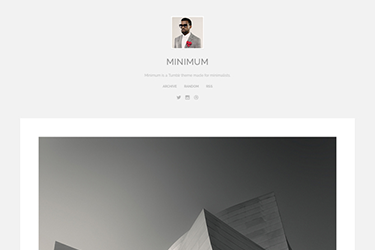 A super simple and minimalistic single column Tumblr theme. 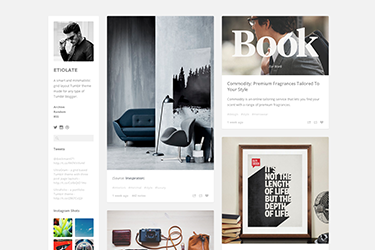 Classic magazine style Tumblr theme, completely customizable to fit any style. 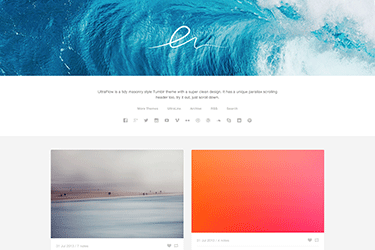 Super minimal and cute Tumblr theme, designed for consuming one post at a time. 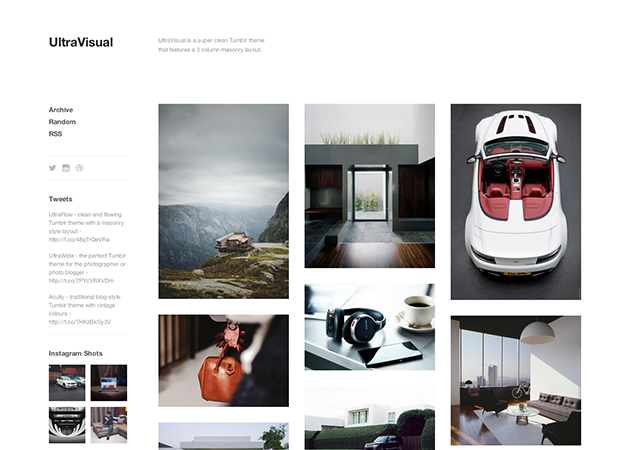 Clean and sharp Tumblr theme with a wide layout. Perfect for long-form content or photography. 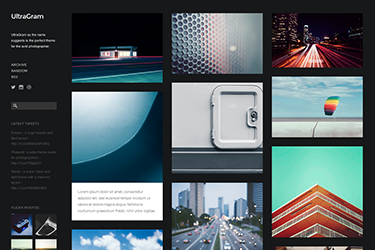 A tile based masonry Tumblr theme, perfect for any type of Tumblr blogger. An excellent theme for bloggers who love to write. Simple design with large fonts. 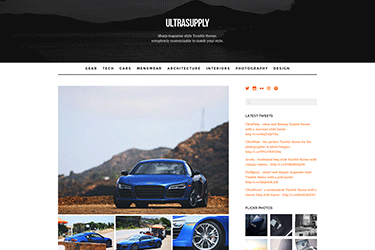 An immaculately clean and sterile theme with a masonry style layout. 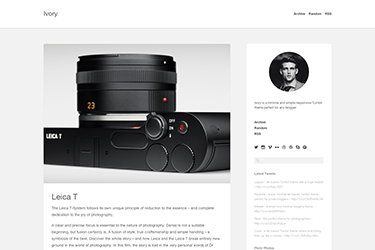 A theme specially designed for photographers and photo bloggers in mind. 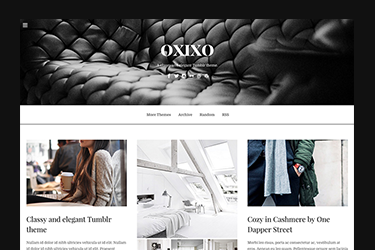 A classy magazine style Tumblr theme that is perfectly designed for heavy content. 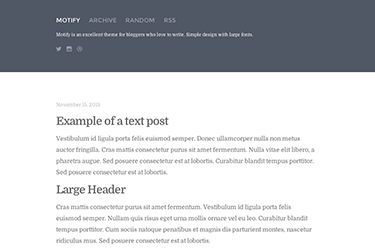 A single column Tumblr theme with a wide layout. Perfect for any type of content. 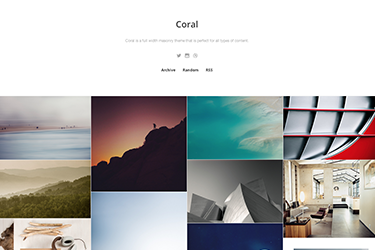 Large header image and nicely flowing content. 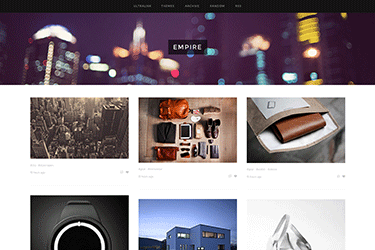 Minimalistic masonry style theme, designed specially to look great with photos. 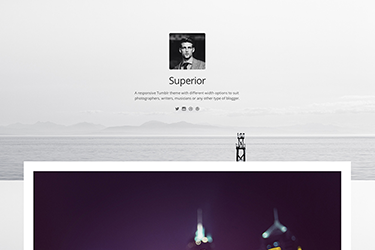 Clean and single column Tumblr theme designed for snappy posts. 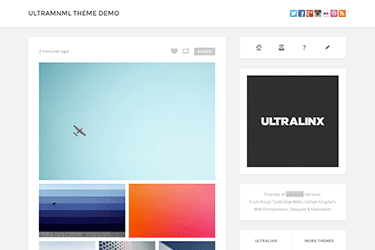 A Tumblr theme aimed at the artist or designer. Perfect for showing off your work. 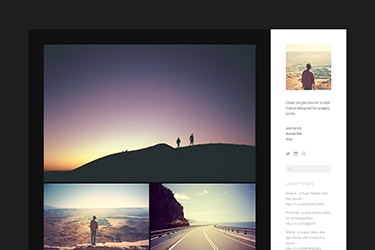 A Tumblr theme aimed at photographers, especially instagrammers. 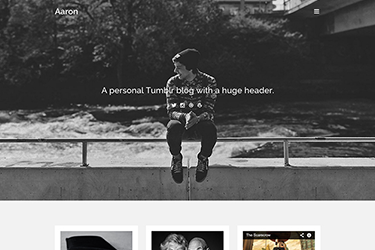 A Tumblr theme made for minimalists. 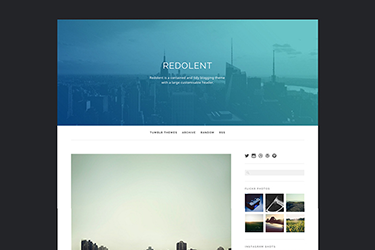 A Tumblr theme made specially for those who want to show off their work. 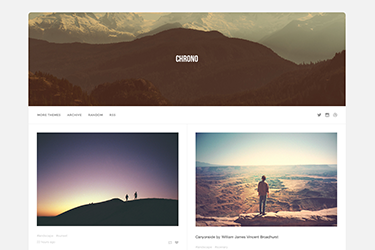 A Tumblr theme made for any type of blogger but works especially well for photographers. 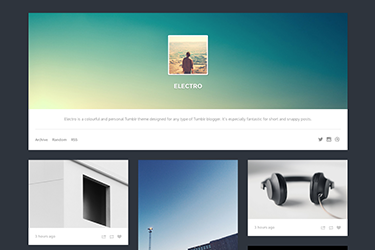 Electro is a colourful and personal Tumblr theme designed for any type of Tumblr blogger. It’s especially fantastic for short and snappy posts. 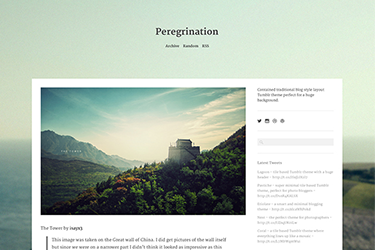 A wide traditional blog style theme with a huge header. 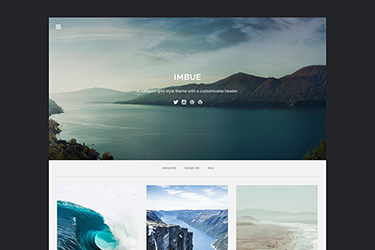 A full width masonry theme that is perfect for all types of content. The perfect theme for any photographer. 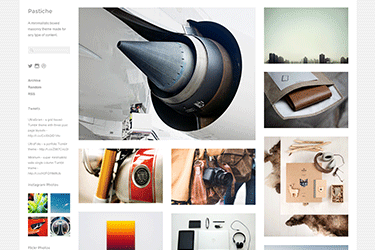 A smart and minimalistic grid layout Tumblr theme made for any type of Tumblr blogger. 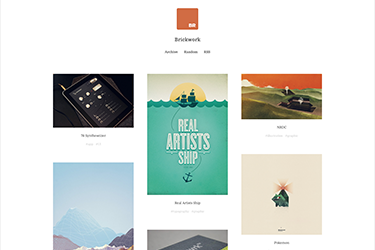 A minimalistic boxed masonry theme made for any type of content. 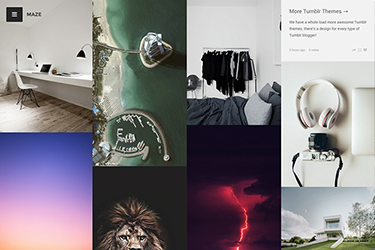 A minimalistic grid style Tumblr theme with a neat hidden sidebar. 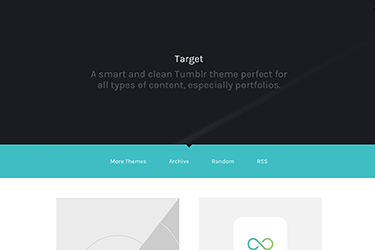 Clean and responsive Tumblr theme designed for easy reading and viewing. 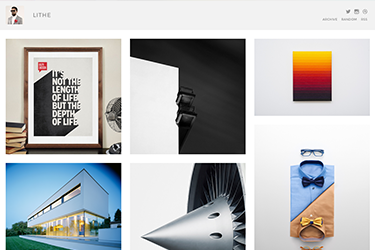 Gallery theme perfect for photographers and photo bloggers. 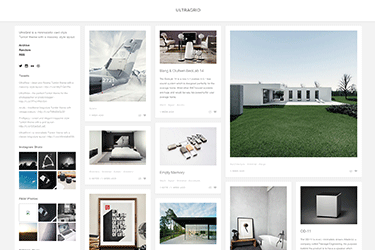 Smart and simple grid theme with the option of different post widths. 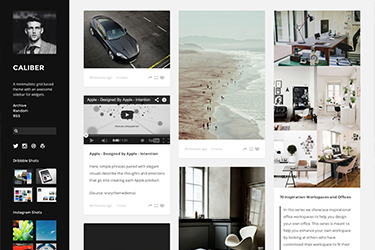 A minimal and simple responsive Tumblr theme for any blogger. 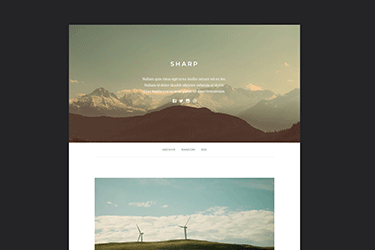 Responsive full width theme with a huge header. 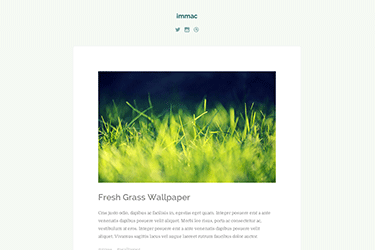 Responsive grid theme with a very large fading header. 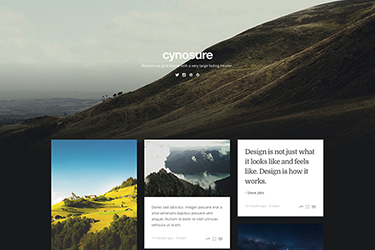 Responsive traditional blog style layout Tumblr theme perfect for a huge background. 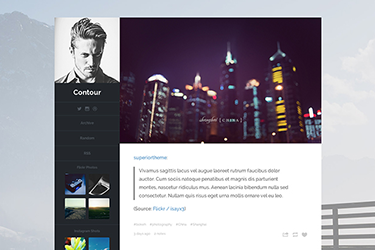 Compact blogging theme made for any type of blogger. 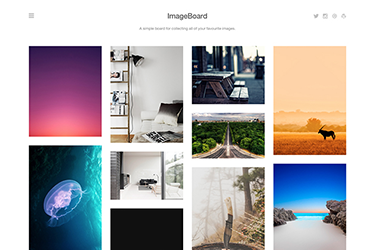 A simple board for collecting all of your favourite images. 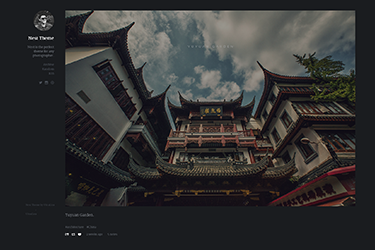 Compact and tight Tumblr theme perfect for portfolios and photography. 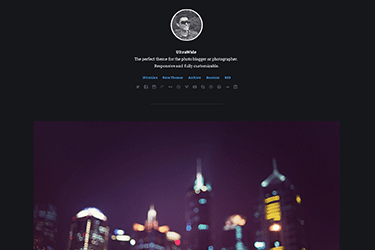 A personal Tumblr blog with a huge header. Minimalistic grid based theme with an always showing sidebar. 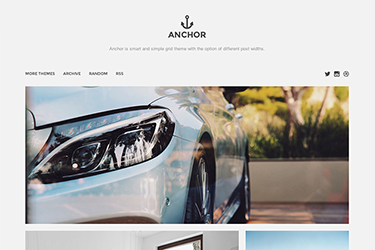 Elegant and classy Tumblr blog theme. 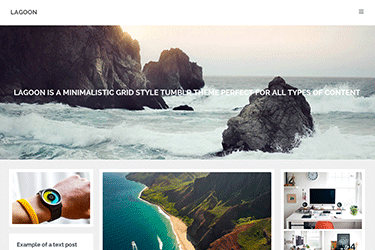 A compact grid style theme with a large customisable header. 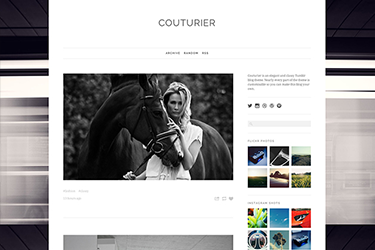 A contained and tidy blogging theme with a large customisable header. 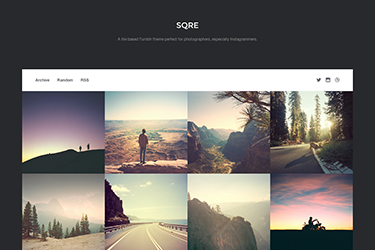 A super clean grid based theme with support for all post types. 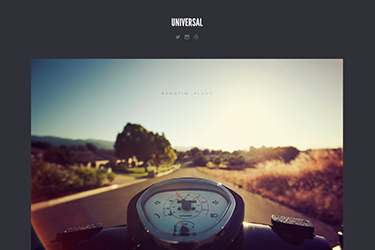 A fullscreen header Tumblr theme. 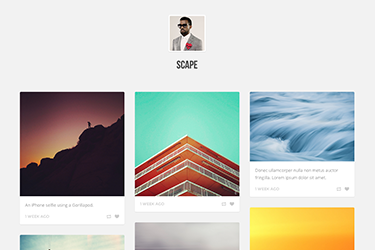 A classy and elegant grid based Tumblr theme. 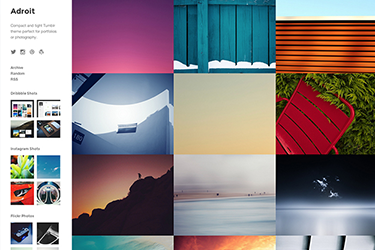 A close grid Tumblr theme perfect collecting images. 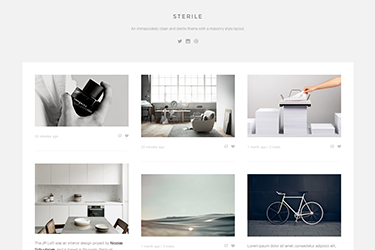 A minimalistic grid based theme perfect for collecting and posting images. 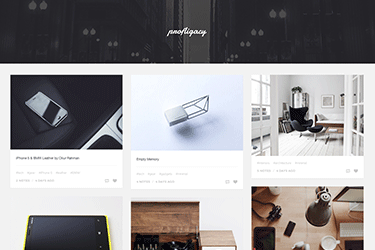 A smart and professional Tumblr theme perfect for all types of content. 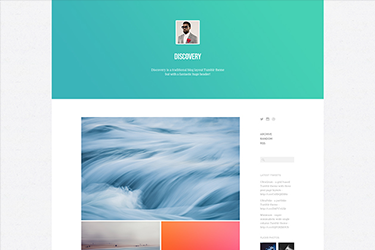 A super clean and efficient traditional blog style Tumblr theme.